‘Tis the season for delivered packages to be left on front porches — and, increasingly, to be taken away by thieves. That’s what kept happening to Eric Bardo of Las Vegas. Last week, perhaps as he was picking up after his big dog, he decided to do something about it. The Priority Mail box sat on Bardo’s front porch from Sunday until Thursday, when a thief finally took the B.M. bait, so to speak. Surveillance cameras captured videos of a boy snatching the poop package and then running down the street with an accomplice. Unfortunately, there is no video of the young thief’s reaction when he opened the box. Bardo decided not to report the crime to police. 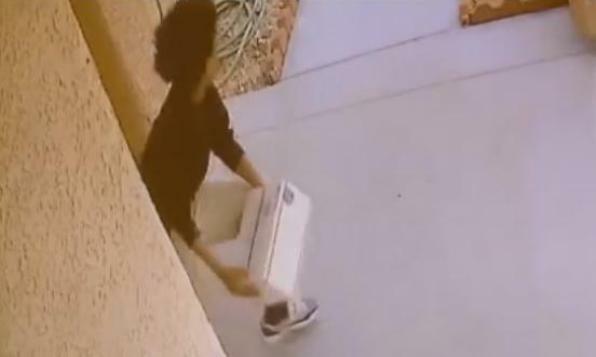 “I didn’t want to call them and say somebody stole a box of poop off my front porch,” he told KTNV. After airing this story, KTNV heard from viewers who said they’d considered doing the same thing as Bardo, but never went through with it. This prank changed their minds. Would you ever consider leaving a dog poop package on your front porch to discourage thieves? Please leave a comment below. Can Dogs Get the West Nile Virus?